There is no substitute for experience in the field when it comes to covert content marketing operations. Rest assured, your competitors are employing their best to achieve a content marketing advantage and for that reason it’s essential that we tap the experience of assets that have “been there, done that” to gain our own upper hand. Thankfully, we have a content marketing pioneer, practitioner and thought leader in Ardath Albee, CEO of Marketing Interactions, speaker and author on our side. Pay attention to her Content Marketing Secret Agent advice and you may find yourself on the right side of content marketing ROI. You have substantial experience in business and marketing and with your current role as CEO of your company Marketing Interactions, how has your work with content as a marketing asset evolved? What do you think about all the recent buzz about content? Since all I work on is content strategy and content marketing for B2B companies, I’ve seen a lot of evolution. There are more channels in use, more types and formats of content gaining engagement and more marketers trying in earnest to understand how to develop content that moves the needle. This year, I’m finally seeing a growth in understanding that buyer personas are a critical tool for creating the foundation for a successful content strategy. Finally and thankfully! It used to be that B2B content had to be long form and formatted in a PDF to be considered viable by B2B marketers. Now short-form content that’s written in a business-casual style is in play very effectively—including articles, blog posts, and social media. The rise of visual content has also changed how we think about content—from videos to infographics. Interactivity is getting more attention, but is still in the very early stages from an execution standpoint. As for the buzz around content, I like the attention the concept is getting, but I cringe at some of the misinformation being thrown around. Content marketing is not just about creating and publishing content at will. It’s a practice based on achieving business objectives through the alignment of content with customer needs. How would you define content marketing to someone that is new to the idea? 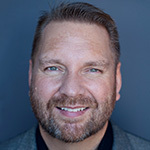 Your session “Applying Company Positioning to Power Storytelling in B2B” is focused on identifying how to use stories in a way that meets the needs of customers. What are 3 of the primary takeaways from your Content Marketing World presentation that you think are most important? 1. Effective storytelling in marketing carries a subtle thread of your company’s distinct value that remains relevant regardless of the topic. (If it doesn’t, you’ve veered away from your “true North”) The objective is that if all identifying marks were removed (logo, company name, etc.) your brand will still be recognizable because the story you’re telling is consistent, unique, and valuable to your audience. 2. Start where the trouble is. If there’s no trouble, there’s no urgency or intention to seek change. However, it’s important to realize that doing so requires you to really know your audience. Trouble for one segment will not be perceived in the same way as trouble for another. To be successful, your content must embrace these distinctions. 3. Ensure that the stories you tell are consistent across channels and available in all the channels your audience frequents with connected pathways that enable them to explore at will. Where do you see content fitting in with the overall digital marketing mix? Do you think content should lead or follow with most digital marketing strategies? Considering that everything at play in the digital marketing mix needs content to work, there’s no way to separate content from the mix. Effective content always follows strategy. Period. If you don’t know what you’re trying to achieve, who you’re trying to engage, or what channel(s) you’ll use, then it’s a crap shoot whether or not you develop the appropriate content for the job. Many companies are challenged to create new content on an extended basis. Can you provide 3 tips for managing long term, effective content creation for marketing? Sure. It doesn’t need to be as challenging as most marketers make it. Mostly this challenge is a construct that we impose on ourselves because we get bored and think our audiences are also bored. But that’s not true if your content is addressing the trouble they’re having. 1. Embrace the Rule of 5: I usually insist on using a content asset in five different ways. This will help marketers address the channel challenge, as well as the difficulty in creating new content. What makes it easier is that while you’re doing your research, it’s much easier to create 5 assets rather than only 1 if you have the plan in advance. Think about the requirements for effective content on different channels, as well. Using content only once is inefficient and expensive. 3. Take a look at your web analytics and select the top few content assets based on performance. Try to determine why they were more successful than others. How can you apply the format or the topic to the development of a new content asset? Think about creating an add-on (serial) piece of content that you can link together with this one. Do you have ideas for more add ons? Serializing content is a great way to extend engagement and make it easier for you to develop content over the longer term because you’re building out a “story” that your audience has already expressed interest in. Content is both art and science with high demands on time and resources, especially for small businesses owners that wear many hats. What tools, software or services can you recommend for marketers that want to be more efficient and effective at using content to drive new business and engage customers? Can you share 3 or 4 tools that are essential? 1. Create buyer personas. Buyer personas, done well, are a tool that informs content strategy and keeps your content development on track and highly relevant to a select few. They increase your efficiency at creating content because you know what information the persona is looking for. And, for SMBs, personas will keep you from trying to be everything to everyone. The most important aspect of content marketing is to pick a niche and own it. “Everybody” is not your customer. 2. Invest in marketing automation. There are many marketing automation solutions with pricing that works for SMBs available. That’s my top pick for improving effectiveness with content marketing. You need to get beyond the aggregate, big picture view down to the granular insights that can really inform you about the effectiveness of your content marketing initiatives based on prospect and customer behavior. Otherwise, you’re blowing in the wind and hoping you’re right. 3. Write a blog. In my opinion, a blog is one of the best, most effective tools for content marketing. It’s a tool I use myself and is responsible for building reputation, credibility, and trust. Many of my clients work with me due to their exposure to my thoughts on my blog. It helps people get to know you, does wonders for SEO and extends your reach. You can use blog posts in nurturing programs, as extensions to topical areas on your website, to expand your social media strategy, to start discussions on LinkedIn, and in lots of other ways. A blog is especially conducive to fulfilling the Rule of 5 that I mentioned above. The best resource for content development software tools that I can recommend at the moment is this guide, 8 Content Production Tools to Help Marketers Transform into Publishing Machines, released recently by the Content Marketing Institute. I’ve tried some of them. Each has its strong points. But what works for whom is a personal choice based on work style and need. Content Marketing Institute’s study earlier this year mentions that most B2B companies are using content marketing tactics to grow their business. While content marketing has a high adoption rate with B2B companies, many are still having difficulty earning internal support. What advice can you offer on winning upstream executive approval for content marketing initiatives? Gaining executive support for content marketing requires that it be tied to business objectives. Executives don’t care about the clicks and opens that marketing measures from email campaigns. They don’t care about the traffic numbers for website visitors. They care about how marketing initiatives contribute to revenue growth and customer retention. This is another reason that I recommended marketing automation in the question above. If marketers are to prove quantifiable value, they need to be able to track and measure lead quality and pipeline momentum. The other thing that marketers need to do is to set the appropriate expectations. Content marketing is not a sales campaign. It takes time to show demonstrable results. I have clients with projects that were constantly threatened to be discontinued in the early stages, but 6 months in, it turns out our initiatives are outperforming the other traditional campaigns in play in other divisions of the company—by huge margins. It’s really that powerful. What’s one content marketing secret that you would like to share with Content Marketing World attendees? Repetition is a good thing. I don’t mean publishing the same piece over and over again, but rather creating a lot of content that comes at a topic from different angles. People need to hear something 7 to 10 times before it becomes an “anchor” thought in their minds and helps them build the confidence to change. Additionally, some angles you take will appeal to a set of your prospects but not others. Using different approaches helps to ensure that they not only see it, but engage with it based on how the approach to the topic resonates with them. I’ve written about many of the same topics for years, and most of the time when I publish something thinking that no one will care because they’ve read it before, the attention and interest is still there or higher than it was in the past. You have exceeded our expectations Agent Albee. We salute you. 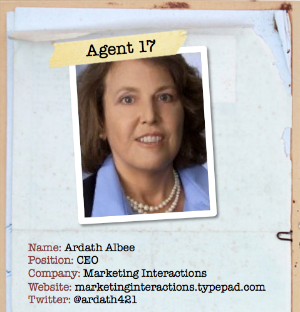 For those attending Content Marketing World next week, hint hint, then you’ll be able to get the full Ardath Albee experience on September 5th at 11:25am with her presentation, “Applying Company Positioning to Power Storytelling in B2B”. You can also check out her blog. Also be sure to check out the TopRank session on the future of optimization: “Optimize and Socialize for Better Content Marketing” – Sept 6 – 3:05-3:50pm (Content Creation & Optimization Track). What’s your best content marketing secret? Share your best content marketing secret in the comments below and we’ll pick 3 winners this week to receive a free copy of “Optimize: How to Attract and Engage More Customers by Integrating SEO, Social Media and Content Marketing”. This is a hard act to follow, but we have an excellent Content Marketing Secret Agent coming up next: Robert Rose of Content Marketing Institute, Co-Author with Joe Pulizzi of Managing Content Marketing and Founder of Big Blue Moose. Love the interview! I’ve been a fan of Ardath’s for some time and am really looking forward to hearing her speak at CM World next week. My secret content marketing tip: write like you talk. As Ardath said, content with a casual-type tone works well. Stuffy prose doesn’t.